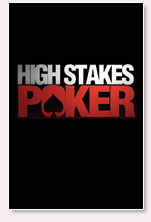 Last week, we informed you that Daniel Negreanu was in for the fourth season of High Stakes Poker, and Brian "sbrugby" Townsend was out, even though he had indicated that he wanted to play. Well today, more names have been released that will be playing in the fourth installment of the show. Matusow, Hellmuth and Laak at the same table? There should be some pretty good table banter in the first few episodes of the show. Negreanu had indicated that he would be playing on the first day of taping, we are not sure if he has been bumped back. We will update once we receive more names that will be playing in subsequent episodes of the show.